Simulated climate models show increasing carbon dioxide and chlorine emissions can drastically alter weather conditions and lead to the formation of an ozone hole over the Arctic. RECENT findings that global warming of the lower atmosphere could trigger major ozone destruction have added an alarming new dimension to the climate change scenario (Nature, Vol 360 No 6401). British scientists John Austin of the Meteorological Office, Neal Butchart of the Hadley Centre for Climate Prediction and Keith Shine of the University of Reading calculate that by the middle of the 21st century, when carbon dioxide levels are expected to double, almost all the ozone in the lower stratosphere above the Arctic will be destroyed. The accumulation of carbon dioxide and other greenhouse gases in the lower atmosphere, known as the troposphere, trap near the earth's surface heat that would otherwise be radiated. This robs the upper atmosphere, or stratosphere, of warmth. The temperature of the stratosphere is a key factor governing ozone depletion over Antarctica. In winter, the icy particles that form in polar stratospheric clouds release chlorine, which destroys ozone. Ever since the ozone hole was discovered over Antarctica, scientists have studied the stratosphere over the Arctic for changes in ozone concentrations. The Arctic stratosphere, even in winter, does not get as cold as the air over Antarctica because it is not cut off by the circumpolar vortex, a winter wall of wind that blows unobstructed over the southern oceans. In the north, the wind is less effective as it is deflected by mountains. The scientists, however, say a considerable change in stratospheric circulation would lead to the appearance of an Arctic ozone hole. Increases in carbon dioxide over the next 50 years are expected to produce such changes by cooling the stratosphere, they say. The changes will lead to the formation of polar stratospheric clouds and subsequently, ozone destruction. In addition, the reductions in ozone could produce some positive feedback by reducing further radiated heat and hence, the temperature of the lower stratosphere. The combined effect of the doubling of carbon dioxide and the positive feedback will result in an Arctic ozone hole formation, say the scientists. Their models showed that when the concentration of carbon dioxide was increased to 660 parts per million by volume (PPMV), the area of depleted ozone increased, but otherwise there was little change. But when the effects of ozone radiative feedbacks were included in the model, the polar vortex, and hence low temperatures and polar stratospheric clouds, persisted, resulting in a substantial ozone change. The model was unable to establish a threshold of carbon dioxide at which the probability of the ozone hole increases. The scientists were also unable to predict the frequency of an Arctic ozone hole formation. At present, however, with carbon dioxide concentrations at 330 ppmv, an Arctic ozone hole is unlikely, they say. But they warn that even if ozone-damaging chlorofluorocarbons (CFCs) are phased out under current international agreements, the amount of chlorine- bearing material in the atmosphere will continue to increase for several years. 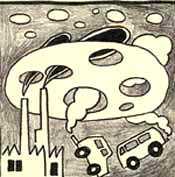 The concentration of carbon dioxide and other greenhouse gases is also likely to increase in the future. They fear these trends are likely to lead to an Arctic ozone hole in the next 50 years "unless both carbon dioxide and chlorine emissions are curbed". The team believes this to be an optimistic prediction. As they, and US scientist Jerry Mahlman from the National Oceanic and Atmospheric Administration in another article in the same volume of Nature, point out, their model omitted several factors that could amplify the effect. These include an increase in water vapour due to changes in methane, which would increase the possibility of polar stratospheric clouds forming. When ozone is lost from the stratosphere, it is not available to absorb ultra-violet radiation from the sun, so the stratosphere cools. "A long-term decrease in ozone might systematically affect stratospheric temperatures so that the beginning of winter could be cooler than in our simulation," say Austin and his colleaagues. This possibility has been put in a disturbing context by the latest measurements of the World Meteorological Organisation, as reported by astronomer John Gribbin (New Scientist, Vol 136 No 1849). The WMO indicates that a long-term depletion in the northern latitudes is indeed taking place. The ozone level was 12 per cent below normal in the areas over Northern Europe, Russia and Canada. The Antarctic hole itself has been worse than ever before due to damage caused by the eruptions of Mount Pinatubo and Mount Hudson.